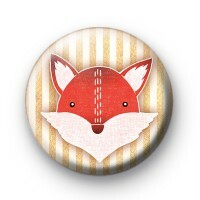 Fantastic Mr Fox Button Badges in brown and cream stripes with a super cute red fox illustration. Inspired by Roald Dahls Fantastic Mr Fox these fox badges are just the cutest. We have a bunch of foxy badges available along with a whole host of other cute woodland creature badges, so have a browse for all of our designs. These are perfect to give out to school children to encourage reading and are also perfect for kids birthday parties. 25mm badge made by hand in the UK.